Every home and its decor is incomplete without a bunch of fascinating showpieces that are spread across the house. Had enough of Laughing Buddha and sculptured showpieces at every corner of your house. Time to settle for some captivating showpieces. May be, the Elephant LED Fire Effect Showpiece? This showpiece is as unique as its name. 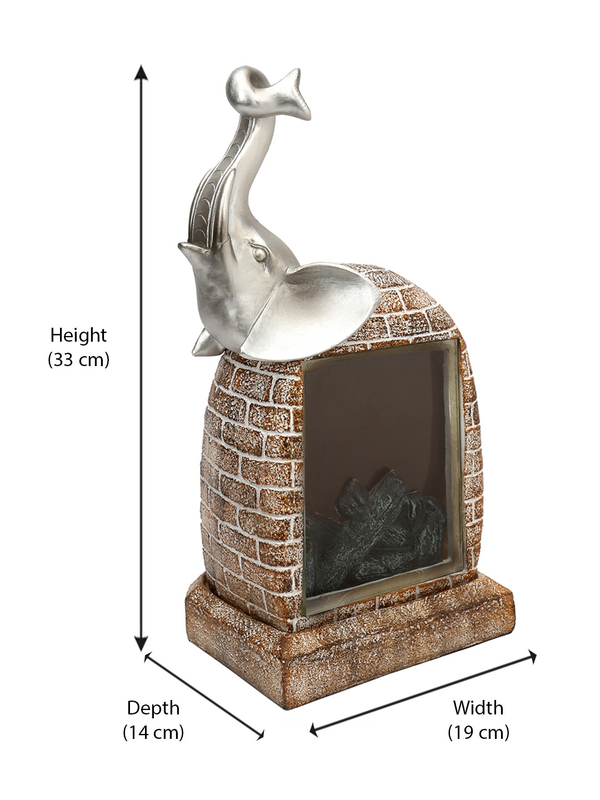 It is beautifully crafted in such a way that it exhibits the look ofa real fireplace exactly like the one burning in your living room during freezing winter nights. The upper right corner of the showpiece has a shinysilverish baby elephant's trumpeting face which adds more to its charm. Right at the bottom of this showpiece, there is an LED switch which when turned on, sparkles magic. With this inbuilt LED, this showpiece shall take the realistic look of a raging fireplace. Showpieces are designed to fill up the ample empty spaces of your house. This piece of art caneither be kept at your bedside or in your living room or any other eye-catchy place. Made with polyresin, this decorative piece is a value for money product. Decor your home space with this Elephant LED Fire Effect Showpiece from @Home.